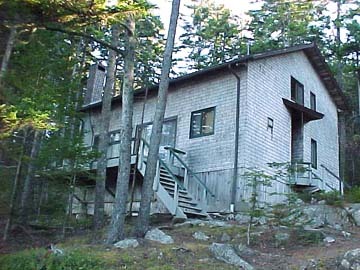 DESCRIPTION: Dow Point Farm is what a Maine getaway should be. 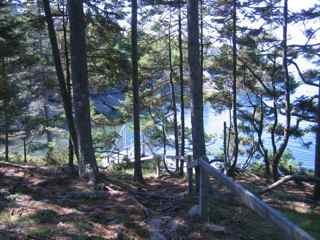 Located in a quiet area on a pretty cove with beautiful blue green waters, this cottage is a great family house with lots of land and waterfront to explore. A private dock is perfect to bring in a boat or to launch a kayak or canoe. Shopping and sightseeing Acadia National Park is only 20 minutes away. A great vacation cottage! LAYOUT: FIRST LEVEL: Kitchen, large living room and dining area with a Vermont Casting Stove, master bedroom with a king bed (2 twins together), siting room, bath with shower and washer and dryer. SECOND LEVEL: Circular staircase to 2nd floor to a bedroom with a king (2 twins together), a bedroom with 2 twins and a modern bath.